Motorola received a lot of praise after launching two of the best and most affordable devices in 2014: the Moto X 2014 and the Moto G 2014. The former is the flagship from the company, while the latter is a mid-range/entry-level offering. Both boast with excellent prices and are popular thanks to their near-stock UI that doesn’t interfere too much with Google’s Android design. Moreover, both have already received the latest installation of the software from Google, namely Android 5.0 Lollipop. People are fascinated by the whole Android Lollipop business and Motorola was the first to start rolling out the update to their devices, ahead of certain Nexus devices even. That and the fact that both the Moto X 2014 and its mid-range counterpart offer great bang for buck as well as a lot of features that users rarely refer to as bloatware or something of the sorts. Purely because Motorola managed to get a lot of high-end hardware into the cheap Moto X 2014 rocketed the company into the limelight after it has been rather dormant in the past year. After the Moto X 2014 and Moto G 2014 were launched, people started seeing Motorola as its own entity, so to speak, without having to mention that they were a Google company before being sold to Chinese Lenovo. 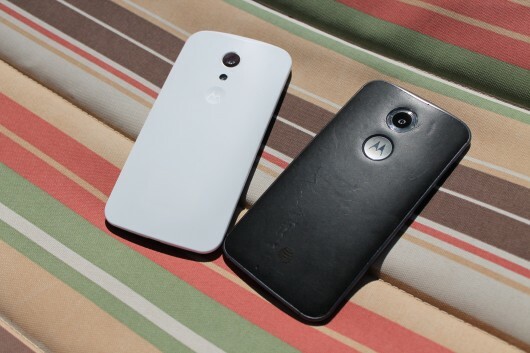 We chose to compare the Moto X 2014 with the Moto G 2014 because many of you out there might be wondering if the latter would be enough to suit your needs or if you should buy the former and get a more future-proof device, filled with neat features. We’re going to tackle this comparison step by step so that you can see which phone offers what and which would suit you more. Let’s dive in then! Motorola has a pretty traditional approach to smartphone design which is evident when you look at the Moto X 2014 and the Moto G 2014 side by side. The two come with ergonomic, sturdy chassis that are surprisingly durable even though they are made of metal. The Moto X 2014 has the distinct advantage of very many customization options through the Moto Maker store, so if you’d like a bamboo cover, or a leather one, or something colorful and fun, and would also like to match the finish on the phone to the back panel, you can totally do that. If you’re the kind of person who holds their smartphones dear and personal, Moto Maker should be one of the best customization options out there. The Moto G isn’t as spectacular in design, but you can’t tell that it’s a lower-end device than the Moto X 2014 just by looking at it. It still comes with a sturdy durable design that reminds of its predecessor, but it does improve in bezel size and overall appearance, making it feel like one hell of a high-end device (even though it’s not). 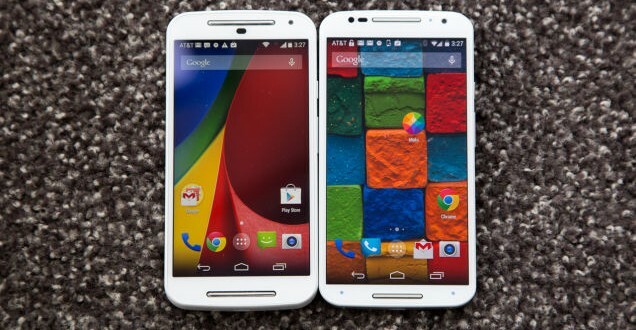 The Moto G 2014 looks bulkier than the flagship counterpart, but its just as maneuverable thanks to its smaller screen. 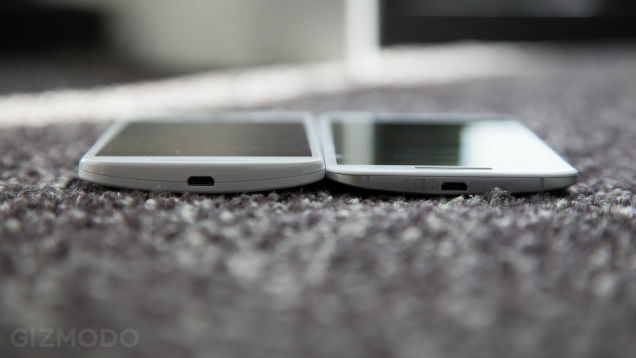 Still, it’s a bit heavier, taller and thicker than the Moto X 2014, but the difference is negligible. When it comes to display, neither are top-notch in terms of resolution, but they can be considered among the best when it comes to power management and pixel density. The Moto G 2014 display is a 5 inch IPS LCD one which comes with a 720*1280 resolution that adds up to 294 ppi pixel density. Even though you can’t exactly discern the pixels on the screen, you can tell the difference in quality if you put it next to the Moto X 2014. The Moto X 2014 comes with a slightly larger 5.2 inch AMOLED panel that has a 1080*1920 resolution that adds up to 424 ppi pixel density, which offers great brightness, viewing angles and outdoor visibility. Corning Gorilla Glass 3 protects the screen on both these phones, so you’re unlikely to scratch the displays, unless you’re really brutal or drop them. Since one of the two devices we’re comparing is a mid-ranger while the other is a flagship, you probably already know that the Moto X 2014 will offer better hardware in comparison to the Moto G 2014, but that doesn’t mean the latter cannot perform when needed. You will get enough processing power out of the Moto G 2014 to get you through your usual applications and games, just don’t expect it to run graphics-intensive games well or at all, depending on the game. Multitasking works just as fine as it does on the Moto X 2014, save for the occasional crash and lag. 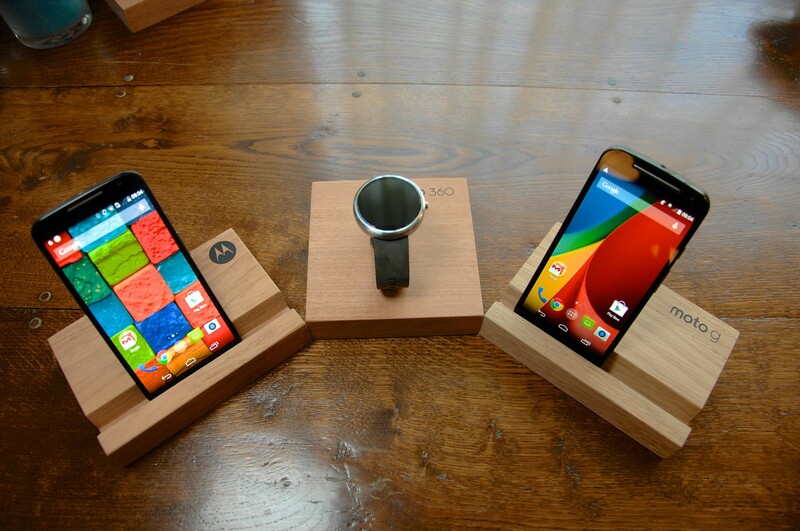 Otherwise, the Moto G 2014 as well as the Moto X 2014 will handle most anything you throw at them without a problem. But for the sake of education, let’s see what each has to offer. The Moto X 2014 comes with a Snapdragon 801 CPU backed by 2 GB RAM and iether 16 or 32 GB internal storage, with no microSD card slot available. You will have to make due with cloud storage on this one, if you run out of space. The Moto G 2014 does have the added advantage of a microSD card slot, but it also comes with an inferior Snapdragon 400 CPU backed by 1 GB RAM and 8 GB internal storage. If you have a lot of apps, that internal storage will not help too much, but it should be enough for the basics. The flagship-mid-ranger distinction can be applied to the camera setup as well. One knows that when opting for a mid-range device like the Moto G 2014, they won’t get much out of the camera and that stands true. You get a decent 8 MP shooter with an LED flash and autofocus on the front and an average 2 MP camera on the front for selfies. Nothing special. The Moto X 2014 camera setup isn’t anything to write home about either, but it does perform quite well even in low-light conditions. You get a 13 MP shooter with autofocus and a dual-LED flash on the rear and a slightly better 2 MP camera on the front if you fancy selfies. Overall, the camera performance on the Moto X 2014 is better than it is on its mid-range counterpart, but it’s not very good. Since the Moto X 2014 comes with a bigger display and a faster processor capable of better power management and fast battery charging, you will get a bigger battery, too. The unit measures 2300 mAh, and is good for about a day and a half of mixed use, which is ok for a phone this size. Battery life could be better, but that depends very much on how you use and maintain your smartphone. The Moto G 2014 comes with a slightly smaller 2070 mAh battery which holds up just as well, even better I might add. The inferior processor doesn’t come with the best power management out there, but it still does a good job with the average battery. Naturally, the Moto G 2014 price is significantly lower than the Moto X 2014 price. You can get an unlocked version of the mid-ranger for as low as $180 if you don’t need two SIM slots and want a completely new phone in the box. If you are content with getting a refurbished or used one, the prices go down to about $130 depending on the retailer, which seems like a pretty neat investment, considering the fact that you get decent specs. The Moto X 2014 price, as you can imagine, is much higher than that of the Moto G, so you’re going to have to think twice before buying one or the other. You can get the Moto X 2014 unlocked for around $550 as a new in-the-box smartphone, but you can get refurbished or used units for about $400 on Amazon. If you want the Moto X 2014, do some in-depth research at various e-commerce sites and physical stores to see who has the best offer so you can get the best bang for buck.